Vale, in their first competitive match since the turn of the year, were very unfortunate not to get something from this clash with the Lowland League leaders. 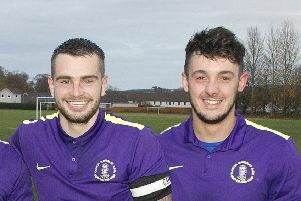 The Innerleithen side had not played since their remarkable 5-4 home win over Edusport Academy on January 5. The weather had interfered horribly with their fixture card since then and the side was determined on Saturday not to lose out on another game. 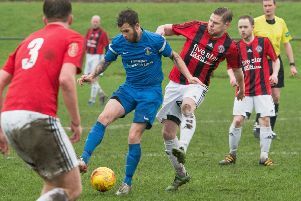 Arrangements were made to switch the game to Spartans’ home at Ainslie Park in Edinburgh, if Victoria Park was unplayable – but the Vale ground passed a Friday pitch inspection. Chris Anderson’s men could scarcely have faced more difficult opponents after such a long spell of rustiness. But the Borders side restricted the Lanarkshire men to just one goal and created a number of chances of their own. “We did very well – we hit post in the second half and were unlucky not get something from the game. We probably deserved a draw,” said Anderson. “There were encouraging signs – we were quite comfortable in the second half. Anderson hoped the return to match practice would signal a run of games until the end of the season. East Kilbride’s goal came after 16 minutes – but that was the only time they found the target. Scott Stevenson played the ball down the line and Chris Humphrey latched on and beat the defence to deliver a ball to Craig Malcolm, who headed home. However, in the second half, Vale created a build-up on the left with the ball breaking to the edge of the box, and Marc Berry smashed a drive off the post. “We were a bit unlucky; we had a few chances after that,” said Anderson. He added: “For me, East Kilbride are the best team in the league – they are up there for a reason. When you play these teams, you’ve almost got a little bit of a shot to nothing. “You are not expected to take anything from the game, so we had the attitude that we would just give it a go and, in the end, we were a bit unlucky.